One thing to note: we didn’t have the dining plan. Another thing to note is that I didn’t list prices, but if anyone is interested, just ask–I wrote everything down for our reference. We often asked for special combinations and considerations, and never would have hesitated if things cost more (though in one case, I had to point it out to the cashier). We weren’t ever trying to swindle in more food, and if it cost extra for a side, we were cool with that! I just don’t want it to seem like we were trying to get extra food. We definitely set aside a large sum of cash for our Disney dining. 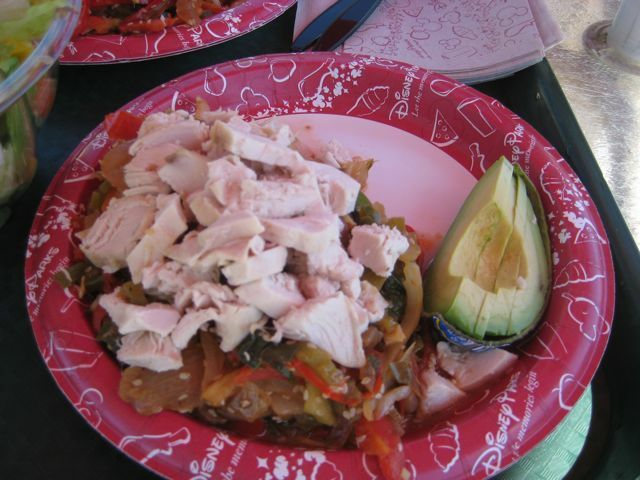 At home, we both eat a really clean diet, so we generally did about the same on the trip. That being said, we didn’t say no to indulgences or once-only-really-at-Disney delicious treats! Poor light + dim restaurants = poor quality photos. I’ll try to detail what is actually in the photo, and let you know about portion sizes. Because the chefs knew we were coming, it made out stay at Port Orleans French Quarter a lot easier! Chef Raphael had contacted me beforehand, and let me know that Chef Carlos was going to be there to help us out. He informed me that they still carry the Bob’s Red Mill Pancake and Waffle Mix (and have dedicated irons). They make them all dairy, egg, and soy-free. They use apple juice for the liquid, and applesauce for the egg replacement. He also said that all they have is Udi’s, and they he would order Ener-G tapioca rolls and pizza shells. He said that they have Amy’s Mac and Cheese (gluten and dairy-free) in the back, too, but I knew neither of us would eat that. We had connected with them on the phone, and they had put up a note that we were going to be there for 15 days. Though we knew we wouldn’t eat there often, we knew that there would be times when we did. Our plane had landed, we were shuttled to the resort, and Mom was starving! I wasn’t too, so we went over to see what we could get. We got to the counter and Chef David was there to great us. He wasn’t who we had spoken to, but he greeted us with a smile. I spoke about what Raphael said and he went in the back to look around. When he came back, he said that the pizza shells weren’t there, and the rolls were. He also said that what they could and could not do. But there was more! He said that since they knew I was coming, they had prepared a black bean dish to go with cous cous (! ), a bean chili (all vegan), and had stocked up on tofu. They also had some fresh vegetables in that they could steam. He said that because they don’t have a restaurant, they rarely carry other vegetables. I red-flagged him on the cous cous and he said that the reason they had that there was because they didn’t know if the vegan (me) also had the allergies/celiac. Anyway, he said they weren’t mixed and in separate containers, and that they hadn’t been in the allergy-location of the kitchen. He definitely knew what he was talking about, so we were good to go! If you take a peek at the menu, you can see it isn’t that friendly-looking for this pile of allergies. Both of us had options of the salad, and that was pretty much it! Mom could have pan-fried chicken with hers. There were also burgers available. Luckily, I had the option of tofu, too. So as I mentioned, I wasn’t eating, but mom had a burger. They gave it to her on two tapioca rolls (because the rolls are really small). She had a salad on the side with just a bit of oil on it and a V8. I didn’t take a photo here but it was exactly as described. We ventured outside and while we were eating, Chef David came out again. He said that they actually brought in some other special items for us, too. In his hand were three kinds of bars: Go Raw, Enjoy Life Chocolate Bars, and another brand I don’t remember. He asked me if they were safe and I read the ingredients. Not only were the Go Raw safe, they looked amazing. I knew the Enjoy Life bars were safe, too. The other had a warning on it (may contain…), so I nixed it. I felt terrible but he didn’t seem to mind. He stood up, said he had to get back (we had all chatted for about 30 minutes), and said, “keep those, by the way!” and gave us them for free. As we all know, it would have been about $15 dollars worth of goods, so that was really kind of him. As well, he had called out Chef Malcolm at this point, who we were introduced to, as he would be the chef for the remainder of the weekend (said Chef David… but he actually was there for the remainder of the stay). The first evening we were there, we knew we were staying at the resort to eat, primarily because we weren’t doing parks until after my race. Plus, we were beat–we were up at 1am for the flight and it was a pretty long day! We headed to get some dinner, and Chef Malcolm was there, looking a little frazzled. Frazzled chefs can definitely make allergy-dining worrisome, so I was… well, a little worried. We went to the salad station, and talked to him. Mom ended up getting chicken with salad, and we asked for some of that asparagus steamed on the side. He didn’t seem to mind at all. 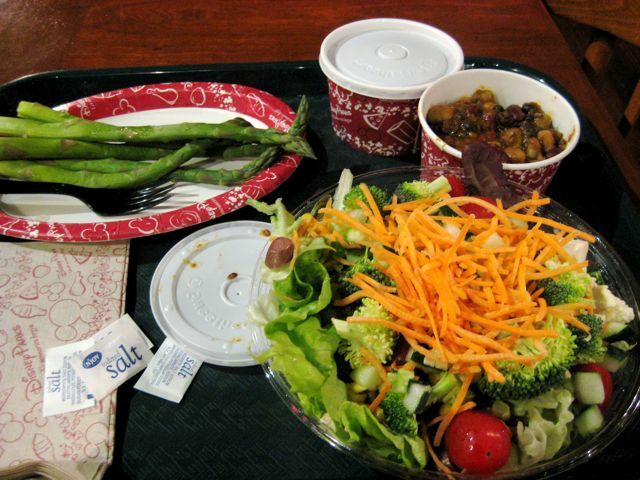 I had a bit of a mish-mash of items: I had the salad but with tofu and some of the asparagus, as well, then a side of bean chili. Another small red flag went up here when we ordered. Chef Malcolm went to make the salads where they make all of them, not in the back where they make everything in the allergy-free zone. I pointed that out right away and he looked at us then went to the back. It freaked me out a bit about eating there, but Mom said she felt pretty confident since he went to the back. 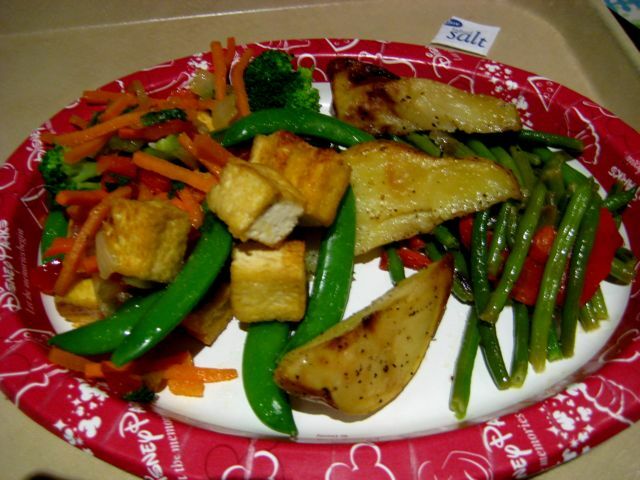 Our meals were good for what they were: salad, chicken and tofu with nothing on them, asparagus. The bean chili was really good — it was too bad that wasn’t a staple on their menu. 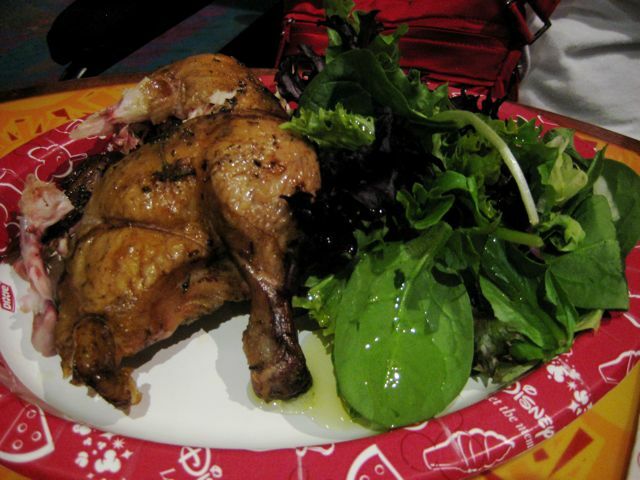 On the second day of our stay, we had lunch again at POFQ. This was because we were staying for 15 days and couldn’t go to the park, plus I wanted to eat something simple since I was racing the next day. Chef Malcolm was there again, and I asked him if I could have a stir-fry with the same veggies that were in the salad, and with tofu. It was extremely oily, but I really dislike oily things so it might have just been my own taste buds. But it was cooked well and yummy enough, and the veggies were fresh. As I was carrying it out, three different people asked what I ordered because they wanted the same thing! Mom had salad with chicken, with a bit of oil and salt. We kept it pretty simple and because of the previous day’s events, I was a little worried about cross contamination with him. The next time we ate here, it was Chef Malcolm again, and about a week later. It was a late night, about 10:45pm, we were exhausted, and just wanted to bring something back to the room. 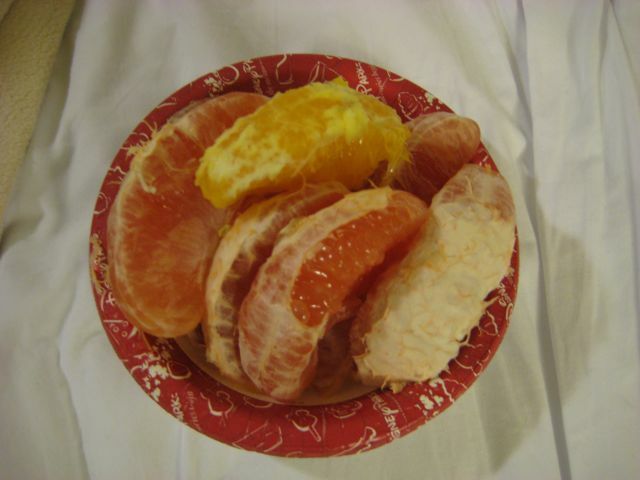 I had also scored a wonderful, huge fragrant grapefruit that I was so excited to eat. They didn’t have them there, but had them at the shop on the Boardwalk (and we had been there earlier), and I couldn’t wait. Grapefruit is my favourite fruit, and to have one grown locally is something exciting for an Ontario girl! Mom’s hankering was a bag of chips. 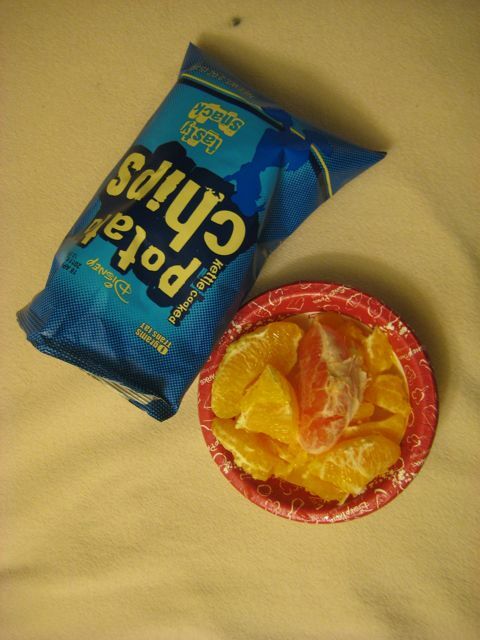 Okay, and a really delicious orange. She chose the plain chips – they said gluten-free right on the package, as well as vegan so we knew they were safe for her other restrictions. They had no soy oil. She took the plain variety over the BBQ because the BBQ had a gross amount of ingredients. I had the same fry-up, and Mom did the same, swapping the tofu for chicken. Overall, they were really great at POFQ. We never ended up getting the waffles or eating breakfast there. They ordered us things in that we could enjoy. I never got sick, which was a plus. Just don’t expect anything extravagant–they are pretty low on supplies. On a side note, we stayed at Port Orleans Riverside last year, and both Port Orleans resorts share their amenities. Though the foods have changed, check out last year’s review for other things we enjoyed while staying there. Menu for Sassagoula breakfast and lunch/dinner. Last year, we had an awesome meal at Sunshine Seasons, but I had known it was probably a one-off because the chef had, by chance, known what he was doing. The day after my race, we brunched at Boma, and headed to Sunshine Seasons for dinner after a day through the countries. It was a messy day, loaded with pouring rain (which lasted considerably long), and I think that the whole park went to the pavilion for dinner along with us. 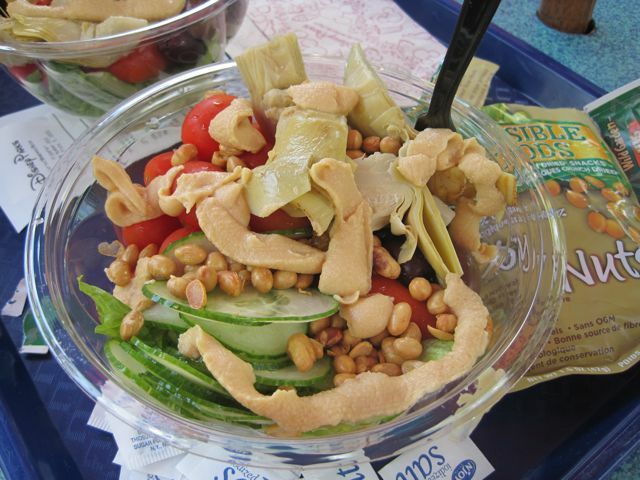 There were very few choices for gluten-free + vegan at Sunshine Seasons. There is plenty for Mom; basically, the whole rotisserie area was fine for her, and she ended up getting the rotisserie chicken (which was a huge half chicken) and a salad (no dressing). I tried to make up a combination, which I did last year, but he was completely uncertain. When I asked about cross contamination, he said, “we do the best we can”. I wanted to leave but didn’t – I figured that, hopefully, he had enough training to do it right. 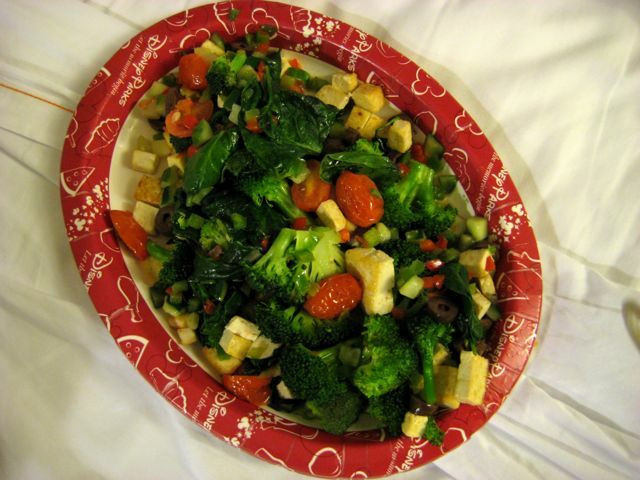 He did a small fry-up of veggies and tofu loaded with oil. It was difficult to eat but I did, anyway, mostly because I was starving. I didn’t feel well after–was dizzy immediately–which is often a symptom I get. I also was still starving after (and later bought an orange). I know this sounds like I am terribly picky, but I’m really not! I love all food (other than what I can’t have), but it was so incredibly oily and bland (thank goodness for salt packets). There were so many awesome experiences on the trip that this just paled in comparison, and if you’re gluten-free and vegan, just be aware that this doesn’t have a load of choices, and, with this chef at least, cross contamination was a possibility. 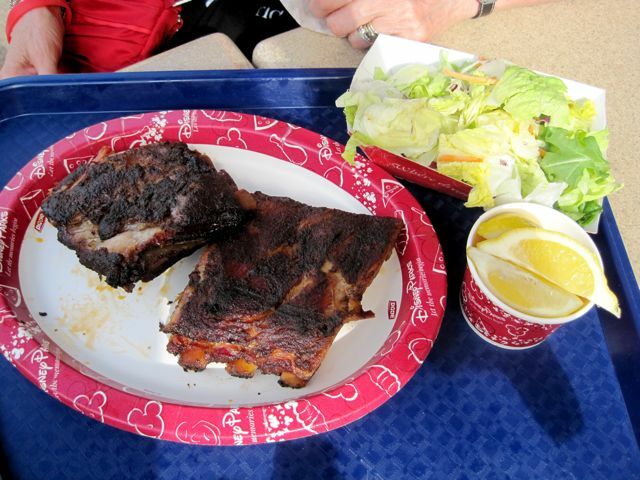 Similar to last year, Mom got ribs and a salad. She said they tasted just as good as she remembered from the previous year. 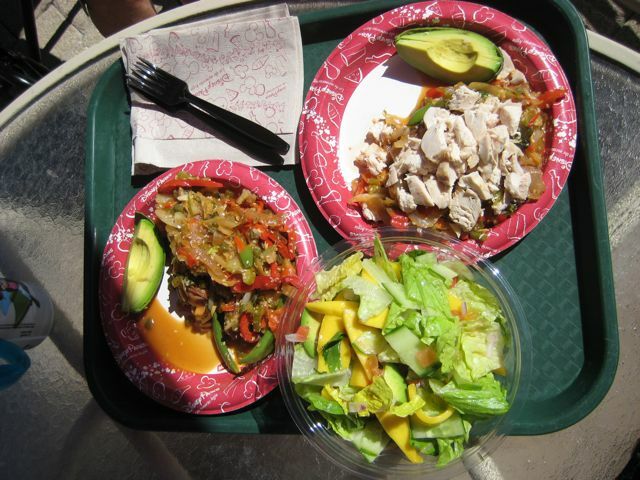 Menu for Flame Tree BBQ. And again, similar to last year, I headed to Restaurantosaurus. I knew that things were going to be different because they wouldn’t have the Ener-G rolls for the veggie sub. I went to the front and eventually the manager came out. He was a young guy, super nice, and really friendly. I told him the situation and he started chatting to me about veganism (I was vegan once, then it got expensive, et cetera…). I asked if, because I couldn’t get the roll and the gluten-free roll was Udi’s, if I could have the toppings of the sub (the grilled veggies) on a bed of lettuce. He said sure, and then they went to ring me up. The lady at the cash register was really nice, but said it couldn’t be done that way. She said the only way I could do that was pay for sweet potato fries (which came with the sub), the grilled vegetables, and a salad separate (which was just lettuce). It would have been over $20! I told her I was sorry, but I couldn’t afford (IE justify) paying $8 for a bed of lettuce, so I would just get the grilled veggies and sweet potato fries, pay for it like I was getting the bun, and just get those. The manager even seemed surprised that they couldn’t do that, and the lady at the cash said, sure, whatever, and rang that up. I went to the side to go wait because I knew it would be awhile. I had asked again for the sweet potato fries to be baked instead of deep fried, even though they have a separate gluten-free fryer. As I went off to the side to wait, the manager came back around and said, “just so you know, I didn’t want to say anything in front of her, but I am going to put everything on some lettuce and tomato for you. Is there anything else you want? 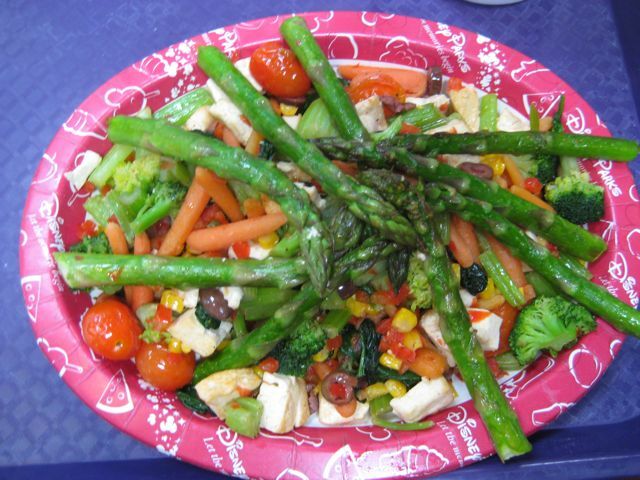 I can make up a dressing, too, and throw in some extra grilled veggies.” I was surprised and thankful and told him it was okay, and that I didn’t want him to get in trouble, and he said, “no, no, it’s fine! I want to.” Super nice! After about a half an hour, they were finished, and there was a pretty generous pile of food in front of me considering what I would have had. Great customer service here, and I wish I had written down his name. I always wrote down chef names, but often forgot the managers. Last year we had some success at Columbia Harbour House, so we thought we would head back this year. I had done some investigative work and say that there was a house salad on the menu, steamed broccoli as a side dish, and hummus available on a sandwich. I figured that, given if the manager was nice, I would be able to make a mish-mash of that. I knew that there was chicken available for a salad for Mom, that we could get the baked potatoes outside if we wanted, and that they had the allergy-free chicken tenders here if she was in the mood. I was pretty set this would be a go. Our manager here was awesome, and at the same time, a girl with celiac came in right behind us. On a side note, she ordered the salmon dish, which was also easily gluten-free (though she had no other restrictions). We talked to the manager and mom decided to have what I was having. I asked if we could get the broccoli on the salad, too, since we weren’t getting all of the toppings. He said sure, obviously that wasn’t a problem! I also asked him if we could get it steamed, as my stomach was acting up that day. He, again, said sure. Then I also asked if we could order a side dish of the hummus, and he said he would just put it on the salad. 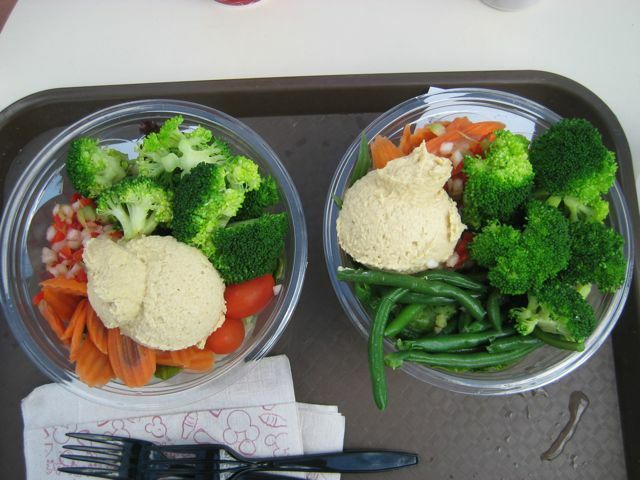 Mom decided she would get the same, and the only difference was hers didn’t have any green beans (too many legumes at once, since she was having hummus). About 2 minutes later, the manager came back with the binder. He said that he couldn’t do the broccoli because their steaming liquid was a broth that wasn’t necessarily safe. I read the ingredients and, though I wasn’t sure, it had MSG and other garbage in it, and was okay with it raw. He said not to worry – it is quickly steamed (in nothing) anyway, so it is naturally tender crisp. Excellent! 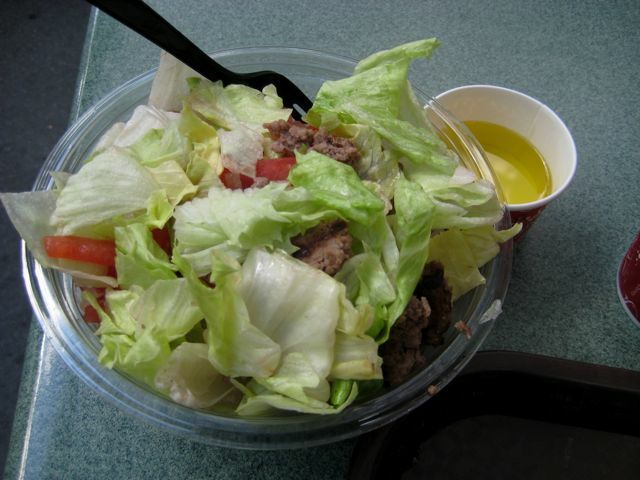 So we got our salads and there must have been about 3/4 cup of hummus on it. And this was GOOD hummus. I had read the ingredients so it was pretty all-natural, but, man, this was GOOD! We’ve both eaten a LOT of hummus in our lives and this was… GOOD! Ha, I suppose I don’t have to say it again! Anyway, it was delicious here, to the point that we said if we wanted a simple, lighter lunch, we would have come back in a flash. We meant to, but were rarely at Magic Kingdom. I’ve always found that Magic Kingdom to be a little more difficult to dine at, so this was definitely a pleasure. Menu for Columbia Harbour House. Last year at Backlot Express, both Mom and I had success, and the same things were on the menu (minus the Ener-G buns). We assumed we would be okay so since we were at Hollywood Studios for the day, we aimed to eat here. Just like last year, I ordered the Southwest Salad minus the chicken. It had a black bean relish on it (which added a bit of protein), and I got it without the dressing (it had avocado, anyway, so I mashed that up throughout it). Things were tasty and simple, just like last year. 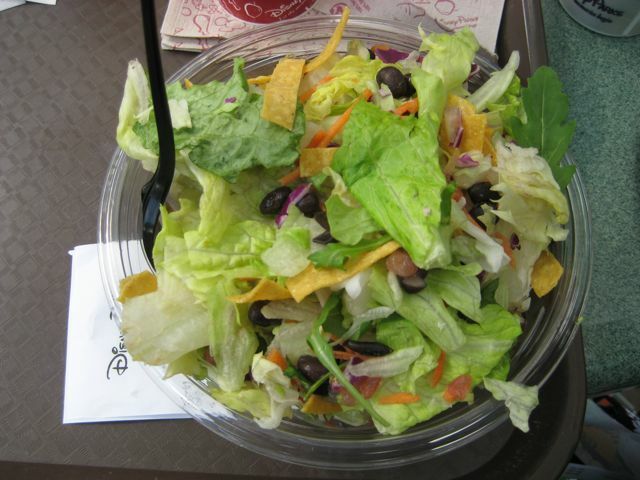 I like having avocado and beans instead of plain lettuce, which is a plus. We actually went back to Backlot Express a second time given the success we had before, but neither of us wanted the same thing. I was having a bit of a stomachache, so I needed something cooked, and Mom wasn’t in the mood for a burger. 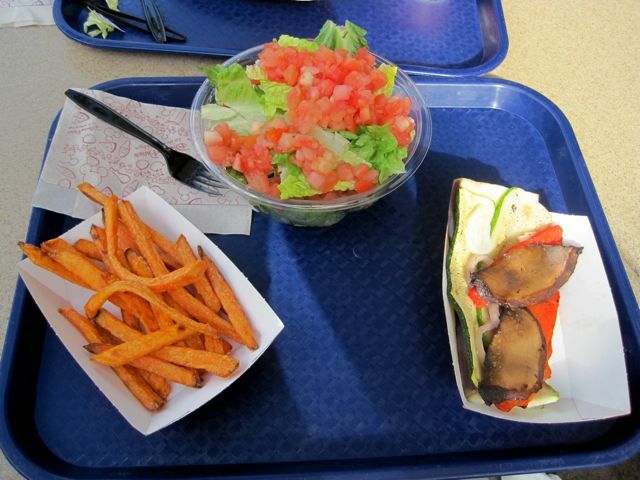 On the menu there is a grilled vegetable sandwich with roasted red peppers, zucchini, mushrooms, and other things. 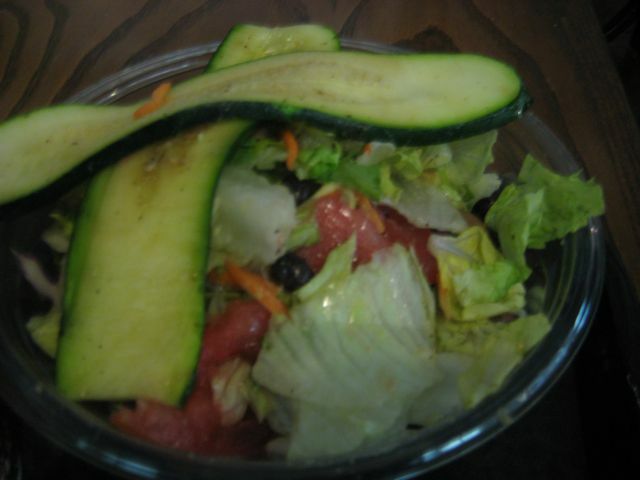 The manager, again, was super nice, and did a combination of the salad and the grilled veggies. My plate ended up being tomato, lettuce, fried mushrooms, roasted red peppers, black beans, avocado, and grilled zucchini. 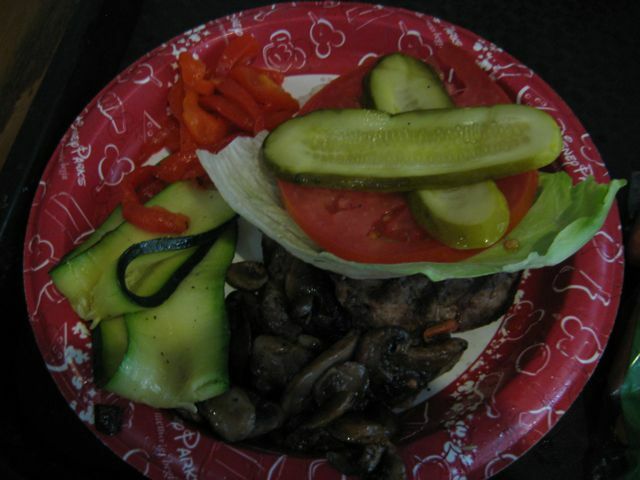 Mom decided she wanted the burger after all, and asked if she could have the tomatoes, mushrooms, lettuce, and roasted red peppers on the side. I didn’t feel too well after this meal, but didn’t feel well going into it. I wasn’t sure if it was cross contamination or just the day I was having. But it tasted good, at least, and they were really kind. Pizzafari, unfortunately, had no pizza options, but we were pretty limited at Animal Kingdom. We didn’t want to go back to Flame Tree Barbecue and Restaurantosaurus, so I headed in here to see if there were any possibilities. Luckily, we had a super understanding manager who had a lot of negative things to say about the current allergy changes at Disney! She was young and vibrant and wanted to accommodate us. I had looked at the menu beforehand and knew there was an antipasto salad that could probably be modified, so I asked her about that. We looked at the ingredients together, and double checked everything that was in there. 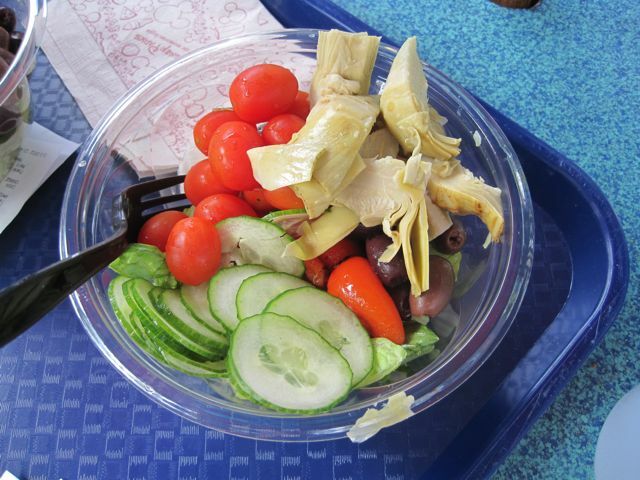 We both had the romaine, cucumbers, black olives, roasted red peppers, and artichokes. Mom also had the Genoa salami. I had a small packet of hummus that was in my race kit, along with some soy nuts I brought for a snack. My salad looked gross with it squeezed on. It also was not good hummus, I discovered (very gritty). But it was at least filled with a bit more nutrition. Such a favourite from last year, it proved to be the exact same. In fact, I believe we ordered the same thing! We both had a pile of guacamole, tomatoes, spinach, and six fresh corn tortillas each. They gave me a boatload of black beans and mom the chicken. The chef knew exactly what we were saying (though a slight language barrier). They charged us just for the chicken tacos. Excellent, simple, and delicious. And so, so filling. I love it here! There isn’t much to say here other than that. Everything is fresh and simple. It’s super cheap for a load of food. It tastes exactly like the restaurant does (which we go to later). The only thing to note is that the cashier totally had no idea about anything. For example, I knew that the frying oil had soy in it from previous years, so I was double checking for that year (IE ruling out the chips for mom). The cashier said, “no, no, it’s vegetable oil.” (which is generally soy oil or a combination of soy oil and something else). Anyway, going back and forth didn’t really help, but the second the chef came out, he immediately confirmed it was soy and we could absolutely not have the chips. I made it easier here by saying I also couldn’t have soy, and just doing the black beans versus chicken and keeping everything else the same. Their guacamole, by the way, is so good. Actually, everything is. Top notch. Huge favourite. Eat here! In the second week, we were more liberal with our time, so we decided to ditch Hollywood Studios at lunch time and head to Caribbean Beach Resort. We wanted to check it out in general because it was one of the race resorts and had considered staying here instead of French Quarter. We figured if lunch was good there, we would stay there and eat. Old Port Royale Food Court has a boatload of options. There were about six different places there, though considering the size of the resort, I am sure it needs to accommodate tons of people daily. We had to wait awhile for the chef, but when he appeared, it was great! We are open to anything and he was super enthusiastic. 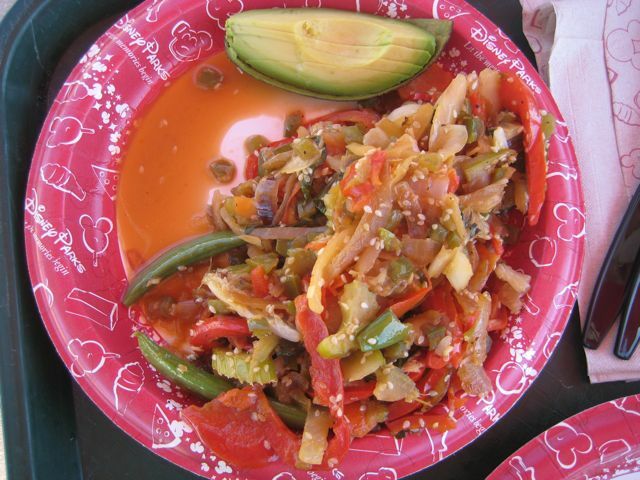 Our only request was no rice on the stirfry because it was pretty late in the afternoon and we knew we would be having a filling dinner in Mexico (with rice, as well) so the veggies were fine. He had chicken on hand for Mom’s. And he even only rang it up as one stir-fry (saying he just “put it on two plates” and a salad! Our lunch cost us about $16 total. One thing I smile about as I remember was his excitement about a vegan meal… At the end when he brought our plates, he described everything on it in true chef style, “… lots of fresh vegetables, with a quick sauce of rice vinegar, toasted sesame seeds, and a little sesame oil to bring it all together. 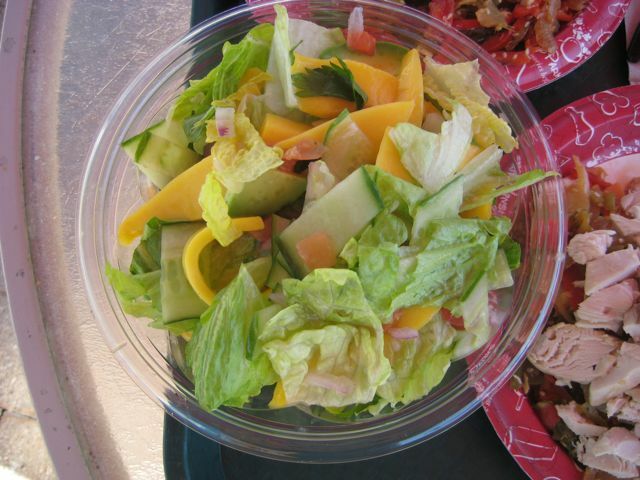 A fresh salad with mango, cucumber, tomato, and red onion, along with avocado. 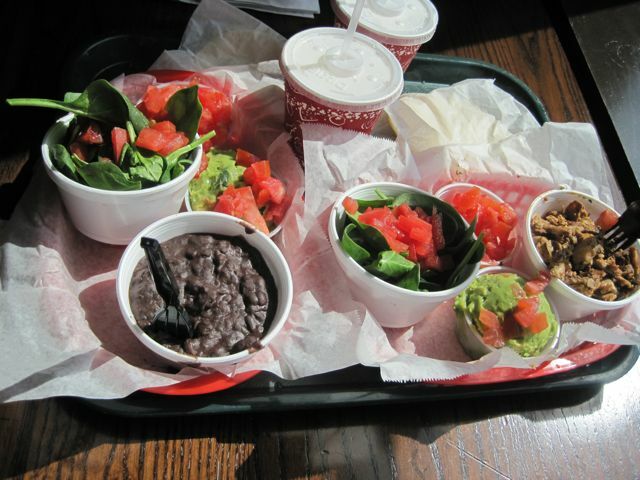 I love our avocados here, and I was hoping you do because my sister does and vegans tend to really love them!” He smile was infectious and the meal was flavorful and filling, far beating out many of the plain salads that we could get in the parks. And the resort is gorgeous! Menu for Old Port Royale Food Court lunch/dinner. Disclaimer: from diagnosis until this trip, I didn’t have one sip of alcohol, though I had baked with it a few times. 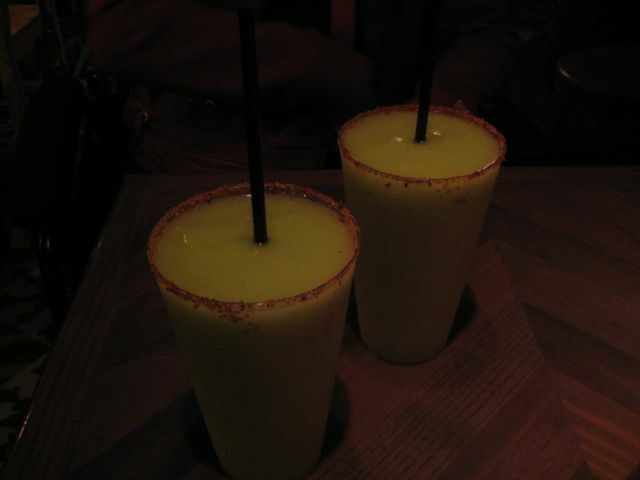 I did know that I wanted to try my first gluten-free beer here (which I did), and decided that, having heard about an avocado margarita, I wanted to try that, too, if it was safe. I ended up having two (not on the same day… I was drunk after about half of one… good ol’ lightweight, a combination of (a) always being a lightweight (b) not having a drink in over six years (c) being pretty hungry for dinner and (d) I’m a pretty small person. 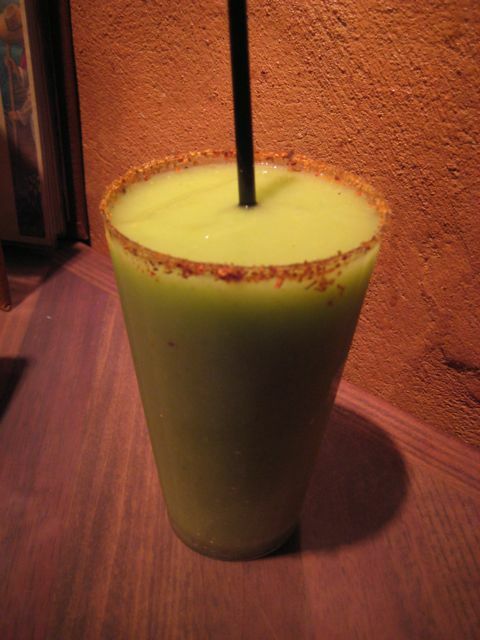 The avocado margarita had melon liqueur, tequila, agave nectar, and a salted lime rim. They were pretty pricey, but I wanted to go for it! 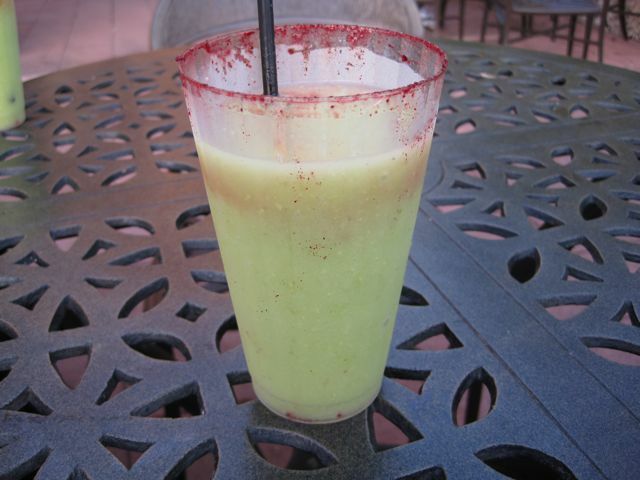 It was super delicious and simple, and I had went there, got the names of all of the products they were using, and made calls from the resort room before we went back to enjoy it later in the week.I double checked that everything else they made in the blenders were safe, too, so that way there was no cross contamination. We ended up going back again, later in the week, and I was a little worried this time as I am not sure if they made it the same way (a different bartender, some language barrier). I actually didn’t feel great after this one, but ended up getting the flu, so I am not sure what it was. I think it was safe, though. Website for Cava de Tequila. When you read my table service reviews, you’ll notice that many of the chefs were prepared and got us Babycakes goodies for dessert (which we didn’t even request, especially since we weren’t on the dining plan… but willingly ate them!) 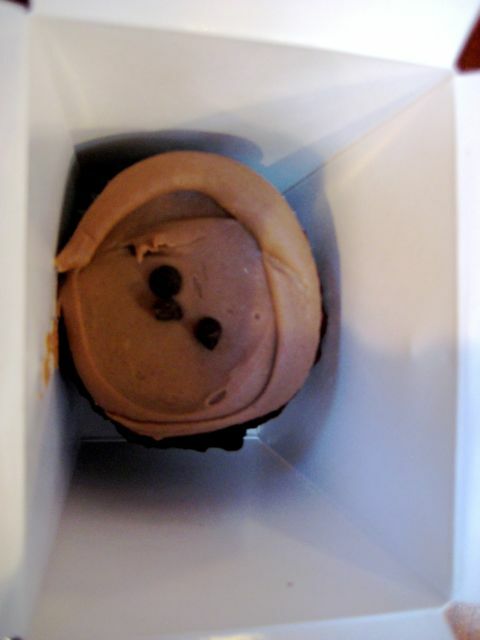 I wasn’t in the mood to get any, though Mom wanted a cupcake. She said it was okay, a little dense and dry, nothing had changed, but cured her chocolate craving for the day. I asked them for a parfait but they couldn’t make it because they only made them when there were day olds. I didn’t get anything instead.